Granted, this is certainly an accurate description of Nags Head's fun oceanfront beaches, attractions and accommodations, but located just west of the beach lies an almost hidden treasure to many new vacationers, the Nags Head Woods Preserve. This natural site couldn't be more different than the summer fun and amenities located just around the corner, but it certainly offers its own allures with over 1,400 acres of perfectly pristine maritime forest and other soundside ecosystems. An unusual habitat on any barrier island, the Nags Head Woods Preserve is even more special as not only is it home to a diversity of plant and animal life, but its location just yards away from the US 158 Bypass makes it accessible for almost any Outer Banks visitor. On your next OBX vacation, take a break from the busy beaches and spend a quiet afternoon exploring the quiet wild landscapes of the Nags Head Woods Preserve, completely hidden in plain sight and always open for everyone to enjoy. The Nags Head Woods Preserve was formed by a partnership of the towns of both Nags Head and Kill Devils Hills, as well as the national conservation agency The Nature Conservancy to protect and preserve a large portion of Nags Head Woods. In the mid-1800s until the 1930s, the area was a well-established local village with 13 home sites, two churches, a store, a school, and outlying farms. Careful observant visitors can find small remnants of this long-gone community via small gravesites in the woods, old brick foundations, or other signs of the forests' former human inhabitants. By the early 1970s, however, the town of Nags Head had become a popular East Coast beach vacation destination, and more and more parcels of land along the soundside were being sold and developed as vacation rental homes or small businesses. Recognizing that the enormous portion of maritime forest on a barrier island was a rare commodity, Nags Head Woods was recognized as a National Natural landmark in 1974, and just three years later in 1977, the two towns and the Nature Conservancy portioned off nearly 1,000 acres to remain undeveloped, but still be free and open to the public. More large parcels of land were added over the years, including approximately 420 acres on the western edge of the Preserve's borders which were donated by owners John and Rhoda Calfee and Diane St. Clair in the early 1980s, and an additional 100 acres that the Town of Kill Devil Hills added to the Preserve as recently as 1997. Today, the Nags Head Woods Preserve comprises of over 1,400 acres of woods, marshes, and even Roanoke Soundfront, and remains completely protected by both consistent local and national efforts. As a result, the Nags Head Woods will remain a natural, unspoiled attraction that generations of vacationers can visit and explore for many years to come. One of the attributes that makes the Nags Head Woods Preserve particularly unique is the barrier of ancient sand dunes that run along the Eastern border of the preserve. This ridge doesn't just mark an incredible relic of the Outer Banks of thousands of years ago, it also helps protect the interior of the Preserve from plant and habitat-destroying ocean winds and salty tides. Because of this attribute, the maritime forest was able to thrive for generations, and still remains as lush and diverse today as it did a thousand years ago. The Preserve is comprised of four main habitats, which vary as wildly as the animals that inhabit each unique ecosystem. The Maritime Deciduous Forest portions most closely resemble visitors' notion of a typical "forest," and is a habitat that can be found on the higher and generally drier dune slopes and ridges, where saltwater rarely trickles in. The dominant plants in this section of the Preserve includes oak trees, hickory trees, beech trees, holly bushes, and loblolly pines, creating a canopy of towering trees, and naturally enriched and composted grounds, covered in leaves and pine needles. In lower areas of the preserve, particularly in wetter valleys between the dune ridges and the higher deciduous forests, visitors will find Maritime Swamp Forests. Species here are more tolerant of constant wet conditions, and the trees in this area are generally a little smaller than their more lofty counterparts, and can include sweet gum, black gum, red bay and black willows. The Maritime Shrub Forest can also be found in low-lying, wet areas, but these areas are overrun with grasses, and squat wild shrubs that thrive in saltier waters. In between all of these portions of Nags Head Woods, particularly in the lowest valleys of the preserve, are the Interdunal ponds, which can be many feet deep and obviously therefore cannot accommodate plant life, but make a scenic attraction along the many nature trails that wind through the woods. With these distinctive landscapes serving as an ecosystem, in total, more than 300 species of plants have been identified in the preserve, including several that are considered to be considerably rare North Carolina residents. One of these is the wooly beach heather, which flourishes in open and desolate sandy areas, and can be spotted by explorers on the Sweetgum Swamp Trail. In the swampy areas, late summer visitors may spot the equally rare Mosquito fern, which boasts bright brick red summer leaves. Two rare seasonal bloomers also call the Nags Head Woods Preserve home, specifically the southern tway-blade, a tiny orchid that can be spotted on the Roanoke Trail in the early summer, and the water violet, an exceptionally rare flower that can be found along the ponds of the Discovery Trail in April and May. Along with this vast variety of plant life comes an equally diverse wildlife, and visitors will find plenty of critters sharing the Preserve along with the occasional human visitors. Nags Head Woods, like many preserves on the Outer Banks, is a temporary home to a number of migrating birds, and a more permanent home for even more. Over 50 species live and nest in the preserve, including a number of colorful varieties such as the yellow prothonotory warbler (better known as the swamp canary), blue and red parula warblers, and even local favorites such as Great Blue Herons and egrets. The preserve has its fair share of Scaly residents too, including snakes, lizards, turtles and toads, and in marshier areas, frogs and salamanders. Visitors with a slight reptile phobia have no reason to worry, as the majority of these creatures are notoriously shy around people and only come out in the late evening hours when there is no one around. In addition, the only poisonous snakes in Nags Head are the rattlesnakes and water moccasins, which rarely engage in human confrontations. Very observant visitors may even notice the brightly splotched leopard frogs and slider turtles, which hide along the edges of the Interdunal ponds. As for mammals, visitors can spot standard forest dwellers, such as squirrels, rabbits, raccoons, and possums, the occasional white-tailed deer which makes skittish appearances all along the higher and sometimes lower forests, and even the Outer Banks' most prevalent coastal water lovers, nutrias, which can occasionally be spotted barreling through the marshes or across the small salt and fresh water ponds. Regardless of what full-time residents you encounter in the Nags Head Woods Preserve, rest assured that with the town and Nature Conservancy's careful preservation and maintenance, these locals will be around to visit for all of your Outer Banks vacations. Many visitors will already recognize some of the Nags Head Woods' biggest attractions, such as Jockey's Ridge, the show stopping collection of sand dunes that border the busy 4-lane Outer Banks bypass. Many visitors make a stop to this area of the Preserve for some of the best hang gliding conditions on the Eastern Seaboard, for special events such as the annual 4th of July sandcastle contests, or just to make the tricky trek to the very top for panoramic, island-wide views from the ocean to the sound. But just past this sandy barrier and well-recognized attraction, Nags Head Woods Preserve has acres and acres of terrain to explore. To keep this area accessible to the public, a series of nature trails have been carefully constructed throughout the preserve, from the borders of the sandy dunes to the Roanoke Sound access points. In fact, the trail system runs nearly 5 miles past the borders of the preserve, and through some of the more beautiful locales that the town of Nags Head has to offer. Open all year, visitors of every season have an opportunity to spot something new in bloom, a new quiet path or offshoot trail to explore, or a new seasonal critter that calls the Preserve home. Trail guides and printable maps are available at local visitors' centers, the outdoor information area where hikers can sign-in, the administrative building near the preserve entrance, and online on the Nature Conservancy's website. The Center Trail begins just past the main Nags Head Woods administrative building, and is located just over an adjacent small wooden bridge. This is a short quarter mile loop which is ideal for casual visitors and hikers, as well as young vacationers, and is a perfect introduction to the landscape. The trail meanders across two bridges, and borders a small pond that's filled with the songs of bull frogs and green frogs. Raccoon and deer make occasional appearances on this route, and visitors will travel through a series of woodsy parcels that include maple trees, sweet gums, and even hickories. The Sweetgum Swamp Trail veers off to the left from the Center Trail loop, and leads hikers even deeper into the woods for a full 2.25 miles. 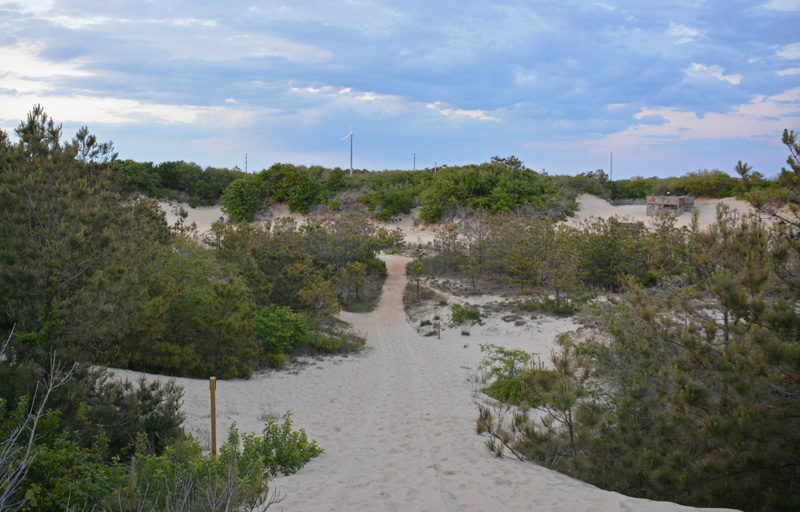 This exploration is the preserve's most popular nature trail, and can be a challenging navigation across several tall dune ridges and a variety of brushy areas. The Blueberry Ridge Trail extends even further past the Sweetgum Swamp Trail, located about halfway around the Sweetgum trail's loop, and continues northeast for a total combined hike of 3.75 miles. Encompassing the sand dunes of the Sweetgum Swamp Trail, this trail also encircles a series of small ponds, providing gorgeous waterfront views and the chance to encounter some of the Preserve's maritime inhabitants. This can be a strenuous hike, especially in wet conditions, so be prepared for the challenge. Hikers will be rewarded with virtually desolate trails and scenery that they can enjoy all to themselves, as well as one of the most challenging fitness trails, spanning across a variety of terrains, that the town of Nags Head has to offer. The Discovery Trail is located on Ocean Acres Drive, specifically to the left of the main entrance parking lot. This easy one-third mile loop is ideal for young visitors, as it winds along several dune ridges, a couple fresh water ponds, and a small but dense cluster of woods and forest. A scenic overlook by the pond provides the perfect resting spot, as well as an ideal locale for lovely Outer Banks photos. 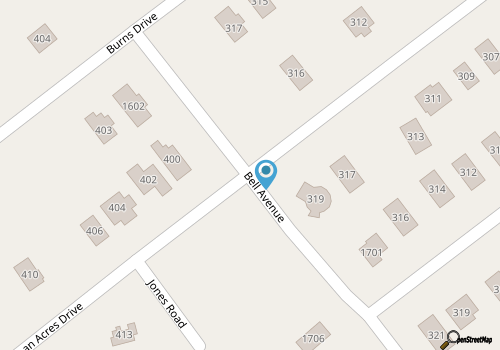 The Roanoke Trail is also located off of Ocean Acres Drive, and is an extension of the Discovery Trail. While the majority of the nature trails in the preserve operate as loops that cover a wide section of Nags Head Woods, the Roanoke Trail is a direct path to the Roanoke Sound and back, for a total hike of 1 .5 miles. A very popular excursion, this trail meanders through salt marshes and thick patches of woods before ending at a quiet and secluded beach overlooking the sound. Though moderately challenging, many visitors find the gorgeous quiet beach, (which is even more of a sight around sunset), completely worth the excursion. The ADA Trail stands for the Americans with Disability Association trail, and is an openly accessible trail for all visitors to Nags Head Woods. While travelling down Ocean Acres Drive, continue about 50 yards past the stop sign to find the ADA trailhead, which is bordered by two handicapped parking spaces. This trail is one of the most scenic the Preserve has to offer, and circles around an Interdunal freshwater pond, a maritime swamp forest, and a scenic overlook of a brackish (or partially saltwater) marsh. The .5 mile trail is constructed of a wooden boardwalk and concrete pathways, allowing visitors with disabilities or young children in strollers an easy route through the woods. The Nags Head Town Trail is located well on the outskirts of the preserve, located off of Barnes Street, and 1 mile from the entrance to the Town of Nags Head Park. This moderately paced 1.6 mile trail climbs over several dune ridges and eventually leads to the beaches of the Roanoke Sound, giving visitors a unique taste of a dessert landscape followed almost abruptly by a quiet soundside beach. Visitors to the Nags Head Woods Preserve can enjoy a variety of activities within the woods itself, including jogging, hiking, birding, seasonal deer bow hunting (generally from September to January), and simply exploring. On the soundside outskirts, water lovers can enjoy access to kayaking, windsurfing, kiteboarding, and even stand up paddle boarding. Clearly, for such an undeveloped parcel of land, there's plenty to do for outdoor aficionados of all kinds. The area is also home to the annual Nags Head Woods 5K, an annual run that has winded through the Nags Head Woods for over 30 years. Typically held in mid-May, when jogging temperatures are at their best, vacationing runners can register at the Nags Head Woods administrative building or outdoor information center, or reserve their spot online. Summer visitors to some of the area's less traveled trails should bring plenty of bug spray, particularly for trails that cover marshy areas or fresh water ponds. Sunscreen may also be helpful during virtually any time of the year, as the warm sun reflected off the ocean and sound waters can produce some intense rays, even for hikers exploring miles inshore. For long hikes, be sure and bring plenty of water. The trails are well-marked so getting lost isn't necessarily a concern, however, hikers may want to bring along a cell phone or a GPS, just in case they intentionally venture off the beaten path. Bow hunting is allowed within the preserve for white-tailed deer, provided it is in the structured and pre-determined winter season, and hunters have a North Carolina state permit. Hunters must complete an application form beforehand, and attend a brief orientation session prior to hunting in Nags Head Woods. For vacationers on a budget, the Nags Head Woods Preserve is an ideal locale for a fee-free afternoon of exploring the Outer Banks. Bring along a sense of adventure and a camera, as the preserve features a variety of scenic overlooks throughout the preserve, and a handful of gorgeous sandy sound beaches. Whether your family thrives on outdoor adventures or simply wants an afternoon distraction from the beach scene, the Nags Head Woods Preserve is a quiet refuge and a delightful natural attraction for locals and visitors alike. On your next Outer Banks vacation, consider exploring all the remarkable attractions located off the beach with a visit to the Preserve. Gear up for a three mile hike, or simply explore a smaller, .25 - .5 mile loop that covers all of the unique habitats that this completely one-of-a-kind maritime forest has to offer. The Outer Banks is world-renowned as being a mixture of a family-friendly beach destination and a wild, undeveloped landscape. When you need a little break from the fun on the oceanfront, consider a trip across the bypass to the soundside forests bordering the Roanoke Sound, and take a little walk on Nags Head's inherent and all-natural wild side. Where is the Nags Head Woods Ecological Preserve? Despite its name, the headquarters and visitors’ center of the Nags Head Woods Ecological Preserve – also known as The Nature Conservancy at Nags Head Woods – is located in the town of Kill Devil Hills along Ocean Acres Drive at milepost 9.5. The extensive Nags Head Woods Ecological Preserve itself takes up a large portion of the central Outer Banks soundside, from Kill Devil Hills to the borders of Nags Head. How do you get to the Nags Head Woods Ecological Preserve? Is there parking at the Nags Head Woods Ecological Preserve? There is ample parking at the Nags Head Woods Ecological Preserve next to the Nature Conservancy and visitors’ center, which is also close to the network of hiking trails. Can you camp in the Nags Head Woods Ecological Preserve? Camping is not allowed anywhere within the Nags Head Woods Ecological Preserve. Are there special events at the Nags Head Woods Ecological Preserve? The Nags Head Woods Ecological Preserve hosts a number of educational events for kids, in conjunction with the North Carolina Aquarium, which are held throughout the summer months. In addition, the site features several annual events which includes the Nags Head Woods 5K Run, which is typically held in May. Where can you stay at the Nags Head Woods Ecological Preserve? Because the Nags Head Woods Ecological Preserve is based in the town of Kill Devil Hills, visitors will find tons of accommodation options in the surrounding area. A number of soundside vacation rental homes are walking-distance close to the preserve, and there are also a variety of hotels, motels, and campgrounds in the surrounding central Outer Banks region as well. Are there restaurants near the Nags Head Woods Ecological Preserve? There are a number of restaurants close to the Nags Head Woods Ecological Preserve, and particularly on the Beach Bypass the borders the entrance to the preserve on Ocean Acres Drive. Once you get into the thick of the Nags Head Woods Ecological Preserve, however, there are very few commercial developments in the area. Are there restrooms at the Nags Head Woods Ecological Preserve? There are restrooms at the visitors’ center for the Nags Head Woods Ecological Preserve, which is located along Ocean Acres Drive, and which is open daily during traditional business hours. Are there mosquitos at the Nags Head Woods Ecological Preserve? Mosquitos can be thick at the Nags Head Woods Ecological Preserve, and especially in the warm and sunny summer months when there is little to no wind. Visitors should pack along bug spray, or plan a late fall, winter, or early spring visit when the mosquito population has dwindled, if not disappeared altogether. Are there snakes at the Nags Head Woods Ecological Preserve? There may be snakes in the Nags Head Woods Ecological Preserve, especially in wooded and marshy areas, so visitors will want to use caution. Watch out for water moccasins, (also known as cottonmouths), as well as copperheads, which are the two poisonous snakes that are found in the coastal North Carolina region. Are there hiking trails at the Nags Head Woods Ecological Preserve? There are a total of seven hiking trails which often interconnect at the Nags Head Woods Ecological Preserve, and which encompass more than five miles total. Visitors can reach the bulk of these trails from the main visitors’ center on Ocean Acre Drive, and there’s also a southern trailhead in the town of Nags Head, just behind the Nags Head Town Hall. The Nags Head Woods Ecological Preserve provides a map of the ensuing trails at their visitors’ center, as well as online at https://www.nature.org/ourinitiatives/regions/northamerica/unitedstates/northcarolina/placesweprotect/nags-head-woods-trail-map-1.pdf. Where are the birding spots at the Nags Head Woods Ecological Preserve? Visitors can find a unique variety of birds at virtually any point throughout the Nags Head Woods Ecological Preserve. A good launching point for a birding adventure is the Roanoke Trail and / or the Discovery Trail, which connect and which both begin just outside of the main visitors’ center on Ocean Acres Drive. These trails lead to freshwater ponds, dense forests, saltwater marshes, and eventually to a quiet beach along Roanoke Sound. How large is the Nags Head Woods Ecological Preserve? The Nags Head Woods Ecological Preserve is roughly 1,400 acres in area. What kind of birds are in the Nags Head Woods Ecological Preserve? More than 100 species of birds have been documented at the Nags Head Woods Ecological Preserve, and the site is also an important nesting area for more than 50 species. Popular birds to look out for within the preserve include green heron, wood duck, red-shouldered hawk, clapper rail, ruby-throated hummingbird, pileated woodpecker, and summer tanager, and visitors can also spot wintering waterfowl and shorebirds along the Roanoke Sound shoreline. What is the landscape like at the Nags Head Woods Ecological Preserve? The landscape within the Nags Head Woods Ecological Preserve. Is truly diverse, as it encompasses deep maritime forest, marshes, sandy dunes, and soundfront beaches. A number of trails that wind through the Nags Head Woods Ecological Preserve encompass some and / or all of these habitats, which makes for interesting and unique hikes through the region. 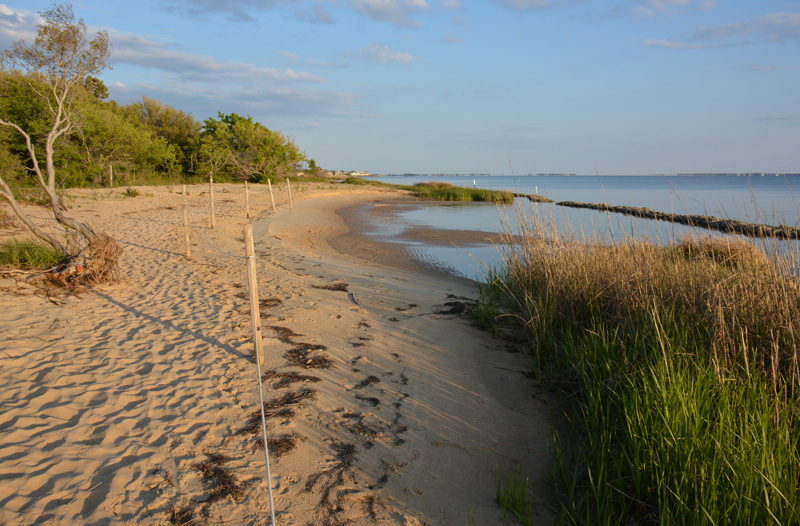 Can you boat or kayak at the Nags Head Woods Ecological Preserve? Kayakers can land on the soundside beach along the Roanoke Sound to access the Nags Head Woods Ecological Preserve from its western borders. There is no boating or kayaking allowed, however, in the interior freshwater lakes that are found in the preserve. When is the best time to visit the Nags Head Woods Ecological Preserve? Many folks like to explore the Nags Head Woods Ecological Preserve in the winter and fall months, when the mosquitos are not a concern. The reserve is also fun to explore in the spring and summer months, due to both the varying activities at the Nature Conservancy and visitors’ center, as well as the preserve’s seasonal collection of wildflowers and more than 50 species of butterflies. Where can you see the butterflies at the Nags Head Woods Ecological? The Nags Head Woods Ecological Preserve’s Butterfly Garden is located at the entrance to the ADA trail (#6), and is easy to reach via the main visitors’ center on Ocean Acres Drive. Can you fish at the Nags Head Woods Ecological Preserve? Fishing is allowed at the Nags Head Woods Ecological Preserve, in both the interior freshwater ponds, and along the soundfront. Freshwater fishing is available via the Discovery and ADA trails, while saltwater fishing can be accessed via the end of the Roanoke Trail. What are the rules for fishing at the Nags Head Woods Ecological Preserve? The interior freshwater ponds of the Nags Head Woods Ecological Preserve are for catch and release fishing only, and no boats, canoes or kayaks are allowed in the ponds. On the soundfront, a North Carolina Saltwater Fishing license is required for all anglers age 16 and over, which can be obtained online or at various bait and tackle stores throughout the Outer Banks. Can you hunt in the Nags Head Woods Ecological Preserve? Hunting is not permitted within the Nags Head Woods Ecological Preserve, with the exception of seasonal bow hunting. When is the Nags Head Woods Ecological Preserve open? The Nature Conservancy, which is the primary visitors’ center along Ocean Acres Drive, is open daily from 9 a.m. until 5 p.m. The trails within the Nags Head Woods Ecological Preserve are also open daily from sunrise until dusk. Can you bring your pet to the Nags Head Woods Ecological Preserve? Can you ride a horse through the Nags Head Woods Ecological Preserve? Horses are allowed on the Old Nags Head Road portion of the preserve only. Can you ride a bike through the Nags Head Woods Ecological Preserve? Bicycles are not allowed on the nature trails within the Nags Head Woods Ecological Preserve, and are only allowed on Old Nags Head Road. Are there trail maps and brochures available for the Nags Head Woods Ecological Preserve? Brochures for the preserve as well as trail maps are available at the end of Ocean Acres Drive at the Outdoor Information Counter. Can you have a fire at the Nags Head Woods Ecological Preserve? Fires and fireworks are not allowed within the Nags Head Woods Ecological Preserve.